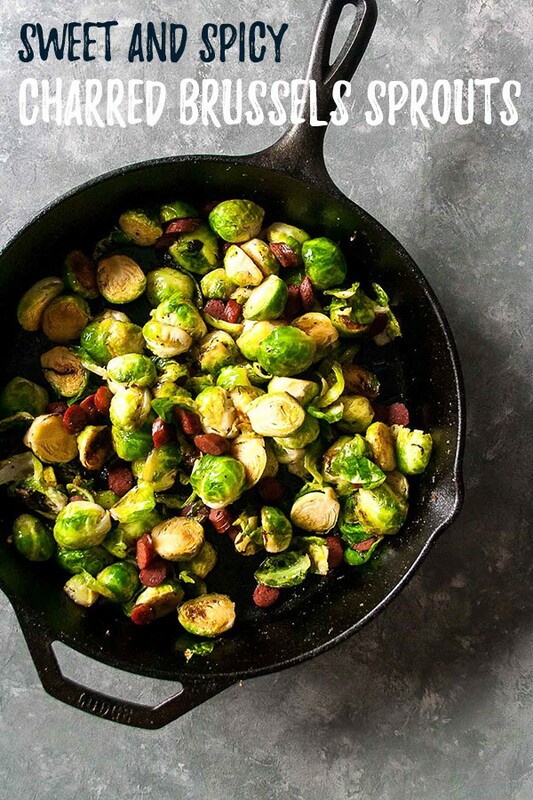 Sweet and spicy charred brussels sprouts are a simple side dish to complement dinner! Made in under 30 minutes, these are sure to satisfy even the pickiest eaters! This post is sponsored by Chomps. As always, all opinions are my own. Thank you for supporting Hungry by Nature and the brands that make it possible! Let’s talk brussels for a second. They seem to be a pretty polarizing vegetable – most people either love them or hate them. Me? Well, I’m in camp LOVE. Like, really freaking love them so hard love. I never grew up eating brussels sprouts; in fact, I don’t think I had ever had them until a few years ago. And honestly, I only heard negative things. Then I decided to try them for myself and form my own opinion about them because dang-it it’s 2014 (it was 2014 at the time) and I’m an adult and I can do what I want! I cooked the brussels on the stove top in my trusty 12 inch cast iron skillet with bacon. And if there are two things that make any recipe better, it’s a cast iron skillet and bacon. So obviously the recipe was a win. But today I’m sharing my new favorite variation on that recipe – Sweet and Spicy Charred Brussels Sprouts! 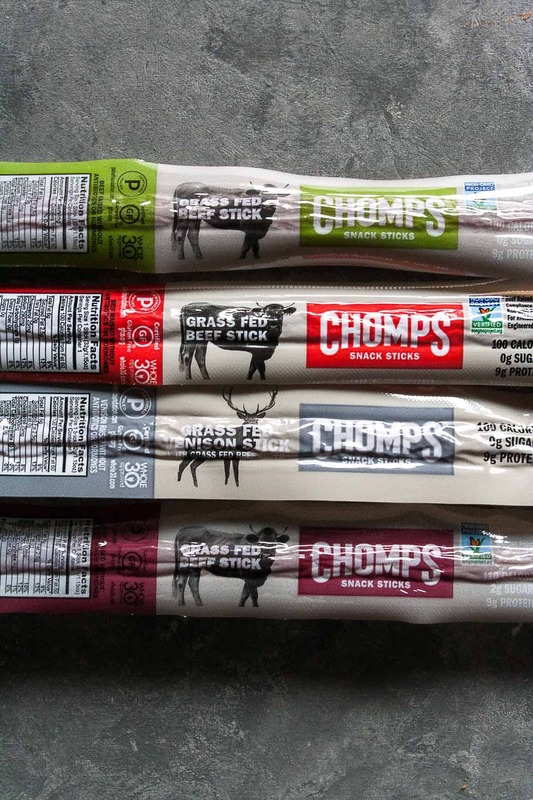 This idea came to me after snacking on my favorite Whole30 compliant snack – Chomps Sticks! I reach for Chomps during the Whole30 because they’re made with 100% grass-fed and grass-finished beef, there’s no junk in them whatsoever, and they are certified Whole30 approved! And as much as I believe in the importance of no BS in my food, flavor is also key. Because if it doesn’t taste good, there’s a good chance I’m not going to eat it. 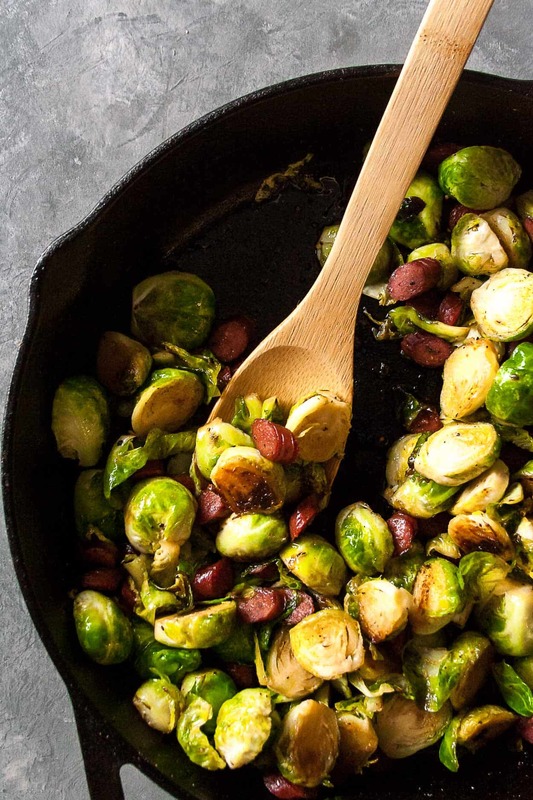 Luckily, there is not issue with flavor here – Chomps has four flavors and I used my favorite with these charred brussels sprouts to kick up the heat… Beef Hoppin’ Jalapeno! Cook the brussels sprouts over medium heat in some olive oil on the stove top. Again, the cast iron skillet is the way to go! I prefer placing them all cut side down in order to really char the surface and letting them hang out there for a few minutes before stirring. After 10 or so minutes of cooking and stirring, add in 3 Chomps Beef Hoppin’ Jalapeno sticks – chopped – and a drizzle of maple syrup. Stir until the maple syrup coats the sprouts. Helllllllo sweet and spicy side dish of my dreams. AAAAAND lucky for you, I am hosting a giveaway for YOU on my Instagram so you can make these Sweet and Spicy Charred Brussels Sprouts too! Head over to my Instagram for a chance to win a Chomps Variety Pack which includes 5 sticks of each of the 4 flavors! 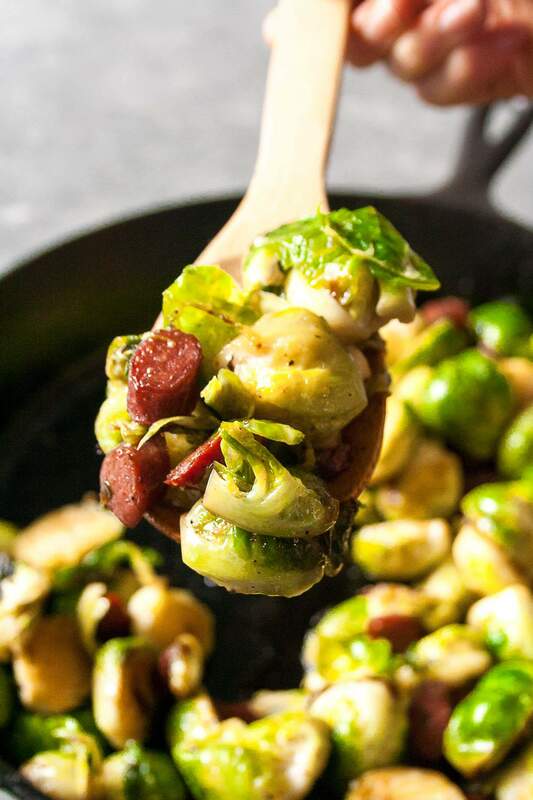 When you make these Sweet and Spicy Charred Brussels Sprouts, post a picture on social media and use the hashtag #imhungrybynature for a chance to be featured! Clean and trim your brussels sprouts. Half or quarter the sprouts depending on the size. In a large skillet (I adore my 12 inch cast iron), heat 2 tablespoons of the oil over medium-high heat. Add the brussels sprouts, keeping them in a single layer as much as possible. Season with salt and pepper. Cook, stirring occasionally, for about 10 minutes, until the Brussels sprouts are tender and have begun to char. 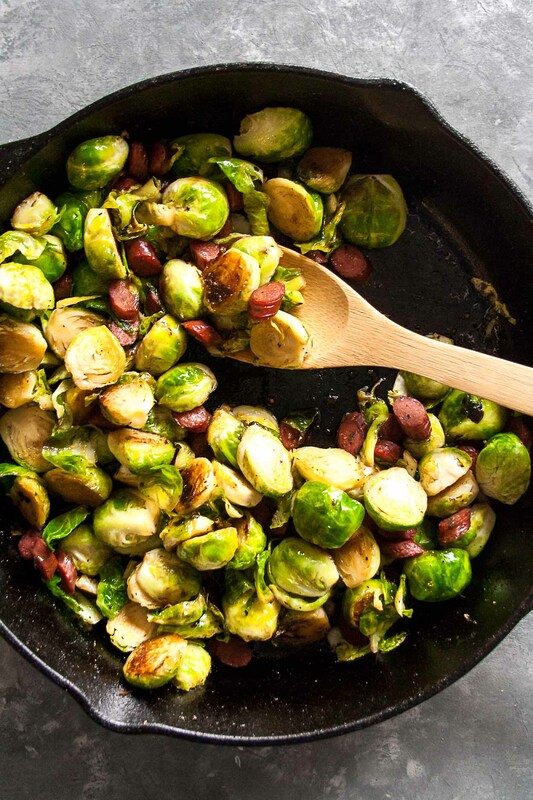 If the sprouts are browning too quickly, lower the heat to medium. Add chopped Chomps sticks and drizzle with maple syrup. Stir until the syrup melts and coats the brussels sprouts.